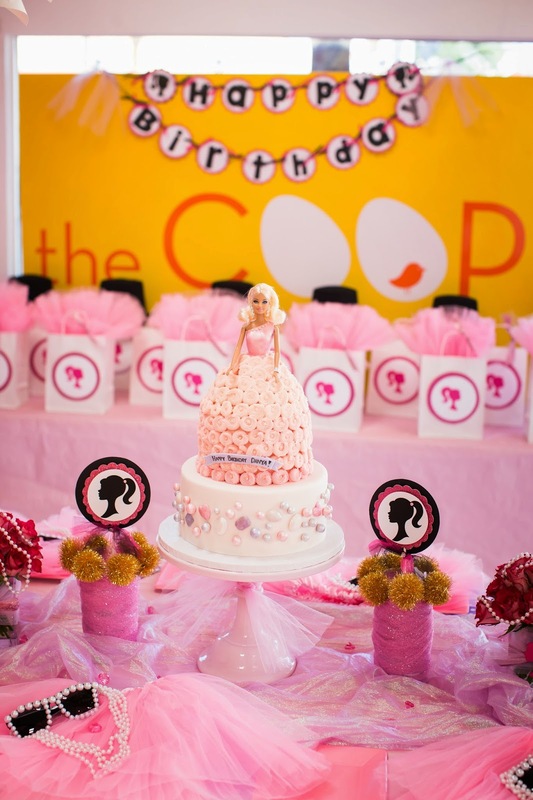 We did this gorgeous BARBIE party for a lovely little girl a little while back. Mom was SUUUUUUUUPER pregnant -- ready to pop any second and wanted us to handle it all for her... which we did... beautifully, I think! We always go for the bolder/ modern choices at the COOP -- and Barbie was no exception. Instead of the cheesy Barbie themed plates and images -- we stuck with the cute ponytailed Barbie silhouette. 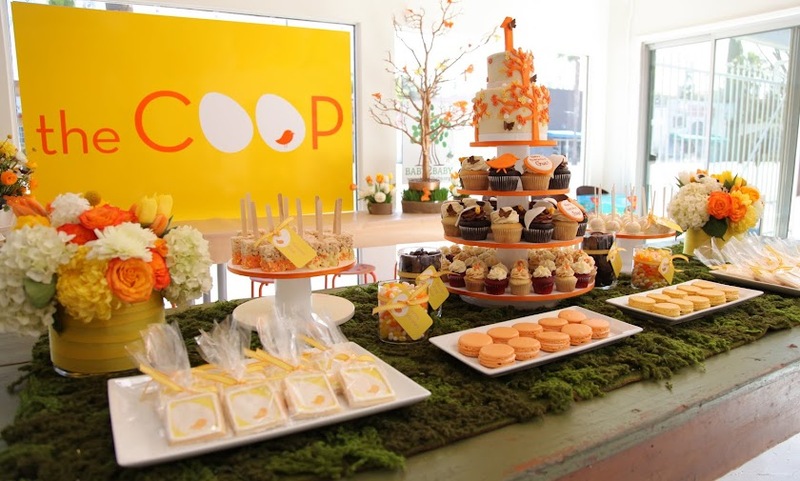 We used the silhouette on the birthday banner, the flower vases, the goodie bags, the plates, the napkin holder... you name it. 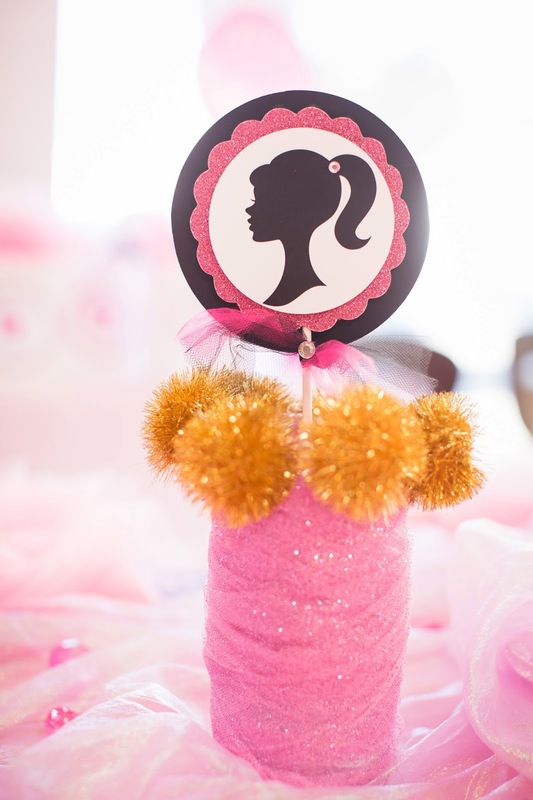 Wherever we saw an opportunity to make a cute Barbie statement -- we did! We also made the two centerpieces with the same silhouette. I made the vases with some gorgeous sparkle tulle wrapped around vases -- then hot glued gold poms along the top for some extra pizzaz!! I love how they turned out. Our amazing Julie from Blue Cupcake did the Barbie Cake... so old school (I am pretty sure I had the ice cream cake version of this cake from age 4 to at least age 9!!) Old school made super fab by Julie!!! 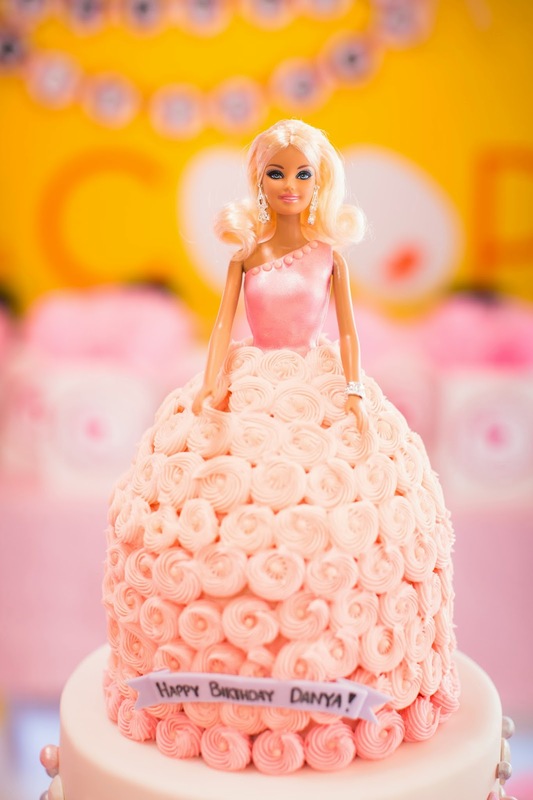 She took the old concept of the barbie in the cake skirt and took it to a whole new level with the gorgeous gems. She's an artist, for sure. 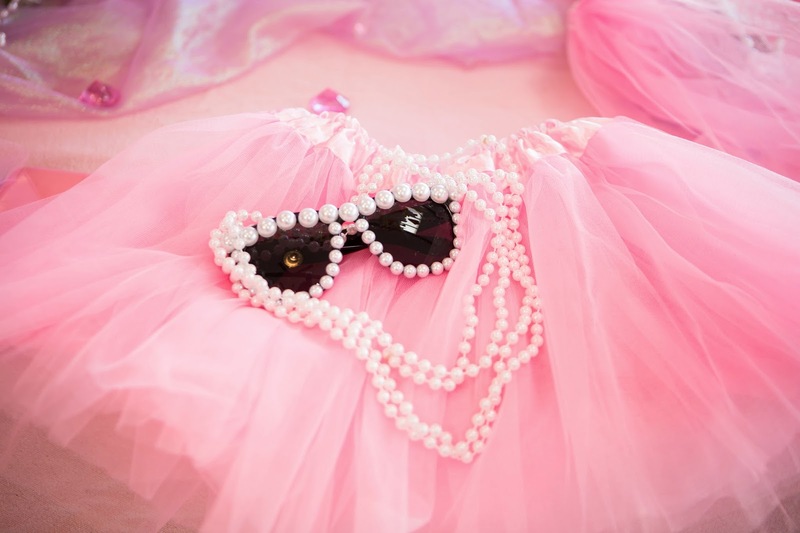 All the Barbie girls got Tutus, a load of pearl necklaces and super cool ray ban style shades adorned with pearls. So girlie-glam!!! Photos are all curtsey of the fantastic Bebe Jacobs... she's simply wonderful! Hope you enjoy!!! My friend's daughter Grace is one of my favorite little ladies... and absolutely my FAVORITE COOP client! She always has very clear ideas of what she wants -- and it's usually something fab. She did the Dolphin, Donut, Disco party -- and the Mod Safari in turquoise and red in the past. I always love her color choices especially! For this birthday -- she's a bit older now so it was a pool party/ COOP Party at Home. She just wanted Candy, candy, candy -- no goodie bags, per se -- just a big fabulous candy bar (we did goodie bags -- but they were empty waiting to be filled with candy candy candy!!!) I am so annoyed that I didn't have a flash on my camera because the party was so so gorgeous -- but my photo skills really were lacking on this one! But I did want to share just a few (albeit sub par!) shots -- as it was such a fun day, for such a fun, sweet little girl! 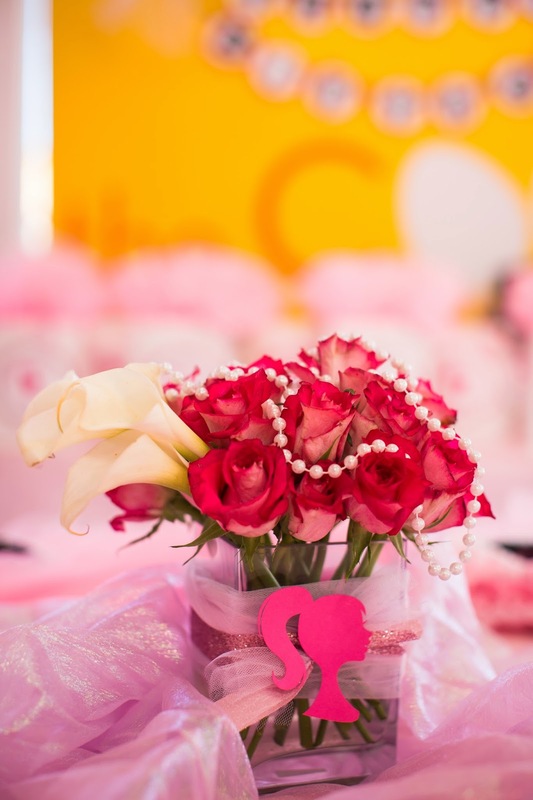 She chose lavendar and red as her color scheme and I simply ADORE how it looked together! The red and white striped runners, napkins, birthday banners -- all really looked so beautiful up against the lavender backgrounds. I did candy bracelets on the juice cups (never enough Candy, remember!!) a HUGE candy bar inside (where I had no good lighting for photos unfortunately!) Funnily -- I spent DAYS upon DAYS wrapping red and white beach balls in cello and ribbon tie-ing the ends for a hard candy look. They were so cool looking -- I FILLED the pool with them. Went back up to the party area to finish decorating -- and the lifeguard UNWRAPPED them all! Such a bummer! But I had to laugh. I guess she thought they were all new beach balls that needed to be opened. At least Gracie got to see them before the disaster! 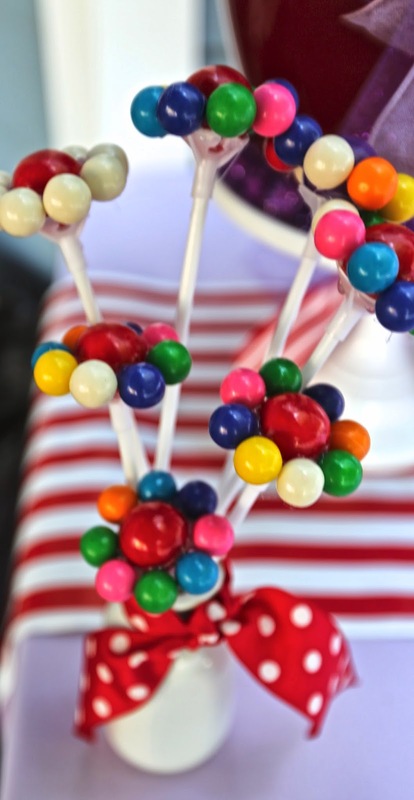 I also made what seemed like 100's of the gum ball flowers which I just LOVE LOVE! I have used them for other parties since... I just adore them so. OK -- so that's it. 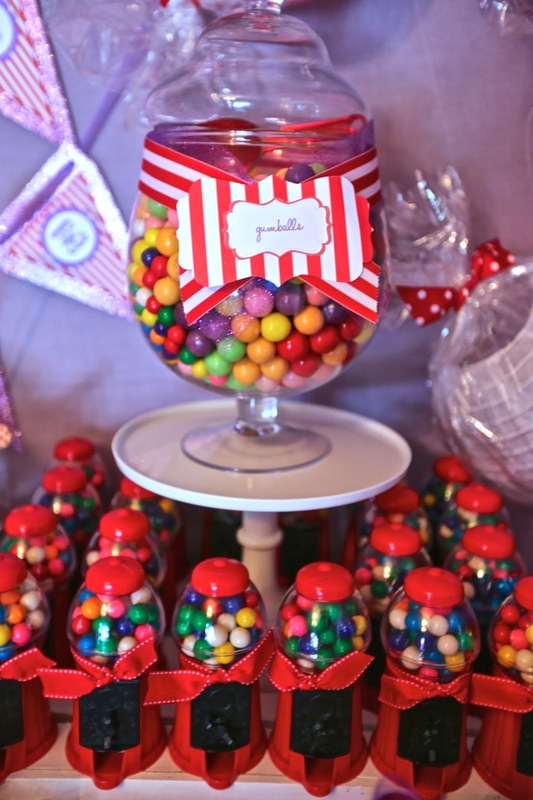 Candy Party at home! Hope you think it's sweet!! !